What ever your situation is, let me help you see what’s in store for you. 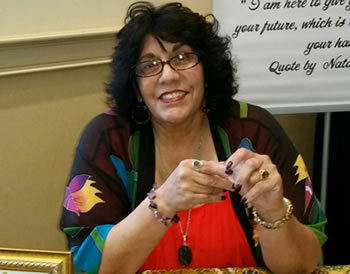 I have been using my gifts as a Psychic Medium for over 30 years past down from my Mother. I receive information by hearing messages, seeing images, and feeling different emotions that Spirit will present to me. I always ask Spirit to give me positive information that you will be able to use in everyday life and in the future. Sometimes we just need clarity and a sign that we are moving in the right direction. Private Readings, House Parties, and Special Events. which is only in the palm of your hands." March card of the month is the Judge Card. This is a powerful card when it is meant for you in your Reading. It's a sure sign that you will have to make a big decisions or multiple decisions in the near future. Depending on the Cards surrounding the Judge Cards would determine what you might be facing. It is always good to take your time when having to make an important decision. Moving to quick may cause you a setback with time or money. Take advantage of the beautiful strong energy of the month of March. Use it in a positive direction for your everyday life. Make the decision that you count! Small changes can make a big difference when you feels like you have one to many things to do. Rearrange your daily routine, give yourself 20 minutes of quit time, a coffee brake or time to listen to an inspirational tape in a quite place. We can't be our best with others if we are not in a good place ourself. For your first big decision for the month of March take the time and ask yourself, what can I do different in my life to be a be Happier and Healthier?